This is a set of 6 standard sized dice in the colors red, yellow, blue, green, black, white, purple out of stock, and pink. A nice complement to your Wahoo (AKA Irk, Aggravation, or Sorry) board game. Sold in sets of two or six. 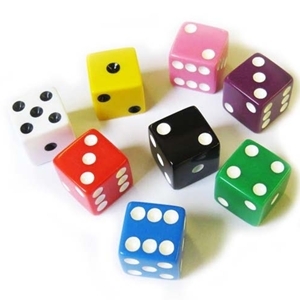 In the six dice assorted option, you will receive 1 each of 6 colors (red, yellow, green, blue, black, and white). The black/white option gives you 1 black and 1 white die. Dice measure 5/8" on all sides. Warning! : Choking Hazard. Small parts. Not for children under 5 years.